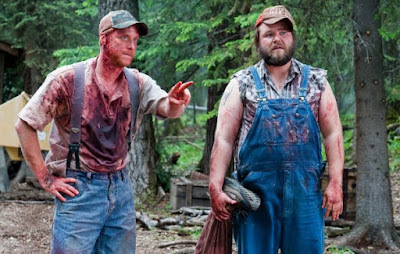 These are several new behind-the-scenes videos for the horror comedy Tucker and Dale vs. Evil, which haven't been released until now. Directed by Eli Craig, it is one of the best horror comedies to have come out in the past couple of years. Tyler Labine and Alan Tudyk only enhance Craig's satirical script, with the crew adding an endless supply of blood and body parts. These new videos were posted on the Tucker and Dale Facebook page and Eli Craig's Facebook page, with Craig noting that his wife found a treasure trove of behind-the-scenes footage that was not included on the DVD release. Check out the videos below.